—Thursday, December 5th, 2013. 1˚C / 34˚F (two different temperature sources) & cloudy-grey @ 2 pm. ———It’s Cousin Mike’s Birthday. I sent him a happy birthday message on facebook. ———I’ve been battling a cold with a nasty, raspy mucous-producing cough for over two weeks now. This morning Cathi suggested I try 5 drops of Oil of Oregano in a bit of water. I searched, but couldn’t find the oil of oregano. ———Also, I’ve been having a rough time finding really important stuff that I thought I knew the location of. That stuff is listed below under “fupp”. ———And… way too often lately, I sit down to write something and succumb to weird pins and needles in the brain type anxiety, & I have no idea where that comes from or what that’s all about. ———I thought, today, that sitting down and writing a running journal might help. It has helped in the past. ———The new (Kijiji special: slightly used MacBook Pro) laptop computer crashed twice in the last two days. I copied and pasted the crash reports from both incidents and I might even toss them in here as some kind of an appendix. Maybe some day I’ll be able to figure out what all the details mean. Maybe the laptop runs too hot? Today, I left the room to take some cough medicine and when I got back the, “You need to restart your computer” message inside a grey box was splattered across the screen. More and more lately I’m wondering if these stupid crashes have more to do with some evil government agency spying on what everybody has connected to what computers than anything that might actually help the computer companies resolve conflicts with software and hardware or anything like that. 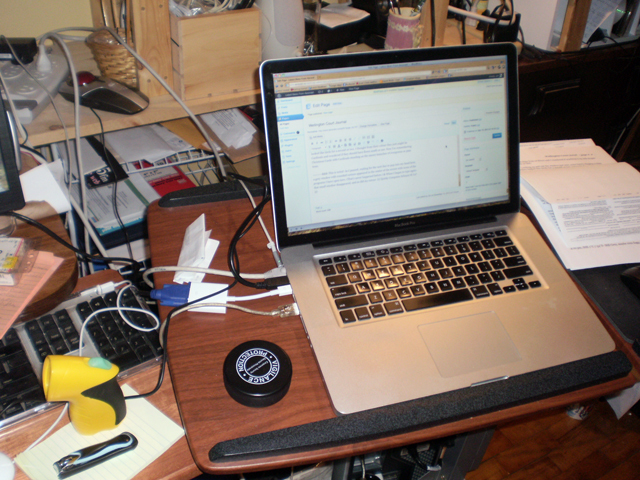 A neat Work Area IS a sign of a sick mind. ———Um, then too, yesterday was Maddie Mae’s birthday. That could have been plaguing me. (Probably was.) Right now I’m remembering Diane (my biological sister) telling me that this time of year was not good for her since Maddie died in a freak house fire on November 5th 1996. And then Diane died of Cancer in March of 2007. Diane’s soul mate, Roger, blew his brains out in the late summer a couple years ago. ———Cathi dreamed yesterday that she answered the telephone and a man’s voice asked for me. She asked who it was and the person said he was my uncle, and insisted she get me and give me the phone. Last night I thought about that a bunch and decided it sounded more like my Uncle Bob than either Tom or Bruce and I wondered if anything is up with Reggie, Danny or Deb. ———Looking up and out the window just now, a few leaves clinging to their branches looked like birds for a second or two. I thought from their colour they just might be Cardinals and wondered if they should have flown south or not. Now I’m remembering Christmas Cards with Cardinals standing on the snowy branches of evergreens or pine trees. ———On the plus side, New Brunswick and maybe especially this area of New Brunswick- seems to have the nicest, most welcoming people I’ve ever moved near. (We’ve been in New Brunswick since September 7th of this year, closed on this house on September 9th, my birthday.) When we got to the house after closing and could then legally unload all our belongings (the moving truck with the movers was here for nearly an hour before we got the official official go ahead), there was a deer casually eating grass across the street. We got photos, not great photos, but we got them. ———I have been able to keep a running blog better than usual since then, until lately, when I ran out of steam, or something like that. ———Also on the plus side, I put together two calendars at Cafe Press this season (last week). One is a collage I needed to fire up the older G4 Mac to put together with ‘obsolete’ software. The other is an 18 month calendar with lots of yummy photographs from the last year or so, (plus the collage featured on one of the months). But then Cafe Press deleted the Collage Calendar from my ‘storefront’ saying the photo didn’t upload right and when I clicked on the link in that email message, I got what looked like an explanation that the photograph/collage was ‘obviously’ unacceptable for one or more of the following reasons: and they listed copyright issues, pornographic content, images that might contain Nazi symbols, content encouraging or espousing hate against identifiable groups, or the image of an identifiable minor. The only thing that might have applied was a photograph of my step son. I don’t believe he’s a minor any longer. But anyway, I went to check the collage to see if maybe it didn’t upload correctly and tried to view that image at the cafe press site, and got the message, “We’ve been doing some house cleaning & that image is no longer available for viewing.” I have a hard time believing anybody out there would ever have cared to look through stuff on this almost never visited site, and I’m slightly bugged that they didn’t tell me exactly why they found anything there objectionable. —4:10 pm, still 1˚C / 34˚F —Still grey and maybe even a bit more foggy. He looked even more confused. Or maybe it would be more accurate to see he appeared to be more painfully confused than before. I need to find the stud finder so I can put the shelf I bought for the computer room here. 4. I have a couple USB 4 way hubs whose adapters have taken a hike. Friday, December 6, 2013. 9˚C / 48˚F @ 5:20 am. Coast to Coast AM : Stephen Bassett first hour, concerned with UFOs and Congressional hearings on life in outer space. PMH Atwater next three hours, talking about the latest generations of kids as the “Children of the 5th [Root] World” or something like that. Autism and ADHD and hypersensitivities making these kids very sensitive to electromagnetic fields and susceptible to overload and negative effects of video games et cetera. Anyway, I’ve wanted to stop and write a list of things I think we need from Costco and / or Staples. Rubber bands to bundle up letters/ paid bills and the like & maybe plastic boxes to pop those bills & important papers in to store them maybe down stairs to free up room to add new (& necessary) clutter to. yellow and both cyan ink cartridges #77 or 78 for the epson Artison 50 printer. & I think there might have been other stuff on the list in my head that I’m having trouble getting out here into the real world. Monday, December 9, 2013. -12˚C / +12˚F @c4:56 am. Dream: Computer game programers in a time and place where governments are secretly gaining more and more total control over everything that people think and do, manage to create a virus that, instead of luring their game’s victims into more and more mind control, subtly begins to deprogram them, leaving semi-ecstatic gaps in their memories which the powers that be self congratulate themselves into believing is proof that their total control agenda is working perfectly, while the programmers are showing signs of falling victim to their own total control virus, they begin ‘waking up’ in a free zone while appearing to be hypnotized and receiving mind control instructions. While in their trances, they type like mad and create what their handlers believe is the moment of ultimate mind slavery and is actually a virus that will free everybody forever from external control by nefarious control freaks. Ask Cathi if her tab or cell phone whistles when it receives messages or anything like that. ((Second night in a row I heard what I thought was whistling in the house when no one was obviously awake. I just tried to save this to my internal hard drive and got the message: That file is locked or already in use. Monday. December 9, 2013. -7˚C / =19˚F @3:20 pm. Purposefully stayed awake and where I could hear the door if mail delivery brought the calendars we had printed. I’m expecting them to come with customs charges. I don’t think they got it right at cafe press dot com. No mail at all so far. I did gt a little bit of writing done. Taking the nanowrimo story where a dream led me and I think that might work. I’m also ‘plagued’ by images from a story I started writing last year (I think) the dragon master? And here we are. almost 3:30 pm totally exhausted, coughing my brains out again. Trying to remember what time I should be taking cough medicine. And the oil of oregano, which probably does more to make me feel better and actually clears up the cold rather than attempts to mess with the symptoms. overall: Gaaaaaa- and my head hurts. achy back bones, achy neck, achy head bones. Much more an arthritis thing than a headache. Feeling discouraged. ache ache ache. But anyway…. Saving and heading for the washroom, blahhhhhh —3:30 almost on the dot. Tuesday, December 10, 2013. -6˚C / +21˚F @ 4:07 am. I dreamed I was watching the elevator operator who picks up the souls of the newly departed. The operator was a woman. Every soul she picked up had a different story and never failed to teach her something. Most of her ‘clients’ thought they were getting onto an elevator. Quite a few thought that the thing she was ‘driving’ around was a truck. She would stand at the controls and her clients (and other passengers) would stand behind her, and they usually stood on her left as she was ‘steering’ her contraption around… (whatever it really was). She would find them at scenes of accidents or where they had died of natural causes, and there were usually several ‘people’ hanging around at these sites to help her go through the charade of picking up a ‘body’ and carrying it into her ‘truck’ or elevator. Everything happened on earth. Actually. She would bring the ‘souls’ to a designated spot and another elevator would come down. Sometimes the souls would walk on to the elevator, sometimes they would be placed on the elevator. Sometimes they would be placed on the ground (as in in a cemetery?) an the elevator would come down and cover the ‘body’ and then rise and leave no traces. This operator was having a strange week. She’d had several newly departed come to her. They asked if they could not be the first to go, but would like to help her with others first, go on her rounds with her. When her ‘truck’ looked like an elevator, they would stand on her right side behind her as she ‘drove’ or used the controls. And each of these unusual passengers were very helpful and left her in a happily stunned state of shock. Then I showed up. She knew I wasn’t dead yet. She looked confused. As I walked into her elevator like truck and took my spot on her right, I told her, “You’re having a very strange week, aren’t you. I’m probably the strangest and I’ve been told I’m the last. But I’m not departed yet. I’m still alive actually-” and off we went. We found helpers everywhere we went. And things went rather well. We’d pick up a newly departed and move to their pickup location, load the departed onto their elevator or into their spot or whatever. The departed would ascend with their elevator or whatever and the helpers would wave, smile happily and vanish. The last one I remember, we went to a rural street where lots of old departed neighbours were hanging around, the woman who was the most recently departed was hiding behind her refrigerator. She’d become aware that all her supposed dead friends were wandering around and that frightened her. One especially close neighbour came and helped the team find the woman’s bloated and quite ripe body and called for the woman to come out of hiding and take at look at her remains. The woman passed out and we carried her about the ‘elevator’ (this woman’s last name had been Gifford or Clifford, I had delivered newspapers to her and several others on that street. I didn’t stick around long enough to see how this woman ascended. There were quite a few other helpers zooming around with the operator. I woke up and needed to use the wash room and realized it was time to take my cough medicine. Wednesday, December 11, 2013. -10˚C / +14˚F @4:00 am. Cousin Sarah’s Birthday. ‘Nerdy’ kids at a late summer camp’s high tech program have their lives disrupted by a series of events that include infrastructure killing solar events- They then find themselves targeted by what at first appear to be random attacks by random bullying gangs taking advantage of the chaos, but then turn out to be black ops operatives. Part of these kids’ program had been an experimental ‘how to deal with bullies’ series of talks. As reports come in that many groups of ‘bad guys’ are posing a police or national guard / army troops. The kids come to the conclusion that the only adult they can trust is a woman who was facilitating the anti bullying classes. But now she is having an unexplainable melt down and the kids end up protecting her. They discover a cache of police grade ‘mace’ spray cans that turn out to be laced with acid. Trying to get away from an insanely persistent stalker they are helped by a mysterious nerdy kid who leads them into an underground maze of tunnels. Now they don’t know if this mysterious kid is trying to help or trap them. —ouch, my back hurts, Ick, My lungs hurt cough cough hack hack took my cough medicine at 3:55 am. Thursday, December 12, 2013.-15˚C / +9˚F @6:30 am. Later, It was a school setting. I think I was a student, convincing a new substitute teacher that he should let me leave the regular class to go study by myself in the library, unsupervised. Part of my argument was, if the teacher had a problem with an unruly student he could sent that student to the library where I would be in charge. I think that argument made sense to the teacher. (I also told him that Jean Smith often let me go there on my own.) I then seemed to be trying to concentrate of somebody’s face, like I was either investigating something (trying to figure out where a missing item had gone and/or who had taken it? or trying to contact a spirit or something. Right now I have the feeling that I am trying very hard to remember more of the second dream or possibly other dreams that occurred before or between the two dreams I partially remember. Domino is moaning and I have a coffee in the microwave. I went food shopping for Cathi. Plus picked up a larger UPS/APS for the living room, to replace the one that goes out any time anybody comes near it. Also got ink for the epson printer. Yawn, It’s 6:44 / 6:45. Facebook notice: Today is Jackie Patrick-Pleau’s Birthday. Friday, December 13, 2013. -16˚C / +1˚F @4:45 am. Following clues in a phrase as some kind of party game. The phrase was something simple and there were photos or a video to follow in context. Example? : “The man was told to find his way inside the lines.” Everybody playing the game would look for lines in the photo they held while watching a video. It was a guessing game something like charades. Each of several people playing the game would look at the same photo and come up with a different conclusion. They all jokingly voiced their opinions. Then they walked to a room that looked almost exactly like the photo they’d been given and looked at objects they had thought illustrated the last word in the phrase. With several examples of ‘lines’ in this room, one clue hid an envelope that contained the next phrase and the next set of photos. Someone picked up a lined note pad and found the envelope and read the second clue which had a word underlined. They studied the photos and moved to something in the room that had been in the photo to move the game along. Cathi and I went to a party with her co-workers last night and the hostess had us sit in a circle and pass metal boxes around to our right or left according to clues in a special version of “The Night Before Christmas” (had extra ‘right’ a nd ‘left’ directions written in. There were three small metal boxes with festive exteriors that moved around the circle and not everybody heard the rights and lefts the same, but the people who were holding the boxes when the poem ended received something that was inside the box (turned out to be gift certificates for 25$ ) Everybody else received a smaller gift certificate (something like $10 toward something at a family restaurant). Cathi thinks I would have a good time if I come to her retirement class today. I forget what the subject of this morning’s class is. She thinks the afternoon class would bore me to death. Right now my head is aching to the point where I can’t focus my mind on remembered details from last night’s conversations all that well. And I’m having a difficult time reading while I’m typing here. I don’t think I mentioned here that Cathi sent me a link to a non credit course @ the University of New Brunswick: Professional Game Design 1. Which is a one day course and looks interesting. It’s 20 minutes after 5 am and I better go take some cough medicine now. See how I feel in a short while as to whether or not I can drive in to take Cathi’s morning class beside her. Saturday, December 14, 2013. -21˚C / -6˚F @ 7:45 am. Today is a “5” day. & Today is supposed to be the better day of this weekend. Tomorrow, Sunday, We’re supposed to get wallopped by snow, expecting 20 cm to over a foot (something like 35 cm.? And I’m not happy about hearing about snowfall amounts or temperatures only in the state approved mode. Canadians did not vote to approve the metric system. It was forced on them. And they were too nice to fight back. Also yesterday, I was wracked with pain when I tried to get up early and go to Cathi’s retirement course with her. I went back to bed and pretty much stayed there, got up to check mail, and let the dog out and fed the cats and the dog a time or two, but that was it. On the plus side, I feel like the worst of this cold may be over. I’ll let you know if there’s a relapse. Today, on a personal night, we should be going out to get dog food and a bunch of other things we need. (groceries?) before the snow arrives. Um, It’s about ten minutes after 8 am and I have no idea where to go from here. I need to find my password book. There is two day old email asking me to log into a couple blogs and deal with comments that might be spam. Watched Xmen the final stand last night before turning on Coast to Coast am and fell asleep in the lounge chair. Sunday, December 15, 2013 (a “6” day) -15˚C / 5˚F @7:50 am ((Two different sources for those temperatures)) & It has just begun to snow- We are expecting a major accumulation (something like 20 to 30 cm / 30 cm is about a foot deep). We went shopping yesterday. Got a few things, then had dinner at Montana’s and went on to see “The Hobbit / The Desolation of Smaug” in 3D no less. We got right in. The web site said the movie would start at 6:30 pm. When we got there we saw three start times listed. 6:00, 6:30, and 7:00 pm. With the earliest being in the 3D theatre. I think there was a waiting line for “Frozen”. People bought tickets and were directed to go stand outside the theatre (but inside the mall) until they were called. I did not go blind, did not get dizzy, did not even get a headache from the 3D-ness. This episode ends abruptly as Smaug leaves the mountain to attack the Human City. Bard is in a jail cell. One Dwarf who had been poisoned by a Goblin’s Arrow was too sick to go to the mountain with Thorin and Bilbo and the others. His brother stayed behind with him as did one or two others, one because he was too drunk and didn’t wake up in time to leave on the boat with the others. Gandalf is hanging in a cage at Sauron’s dark castle out here in the wilds. Sauron is still not quite up to power, He’s a shadow and a ‘Necromancer’- But he is gaining power. Legolas and Thuriel (a female elf, played by a Canadian Actress) had left the Wood Elves’ strong hold as the kingdom was being locked down at Legolas’ father’s (the king) orders. And they were in the Human’s city, killing goblins and stuff. Like I said the movie ends abruptly. Maybe too abruptly. But that’s the only thing I have to say that is not 1,000% positive about it. So now it’ 8:21 am and the snow has begun and the dog wants to get out of his crate and have his breakfast. Oh, since yesterday we have a small artificial Christmas tree (48 inches) two new bracket/hangers for televisions to hang up the two other television monitors we have, a Christmas garden that may or may not have survived the trip home from the store yesterday, a big bag of dog food, a bunch of canned (‘wet’) cat food, and um, (shrug) coffee… maybe a couple other things. I better go let the dog out. It’s 8:25 am. Atlantic time. I woke up from a dream a little after 6 am this morning, thinking I had just seen the time (maybe in the dream) on a digital clock reading 4:26 am. (opened my eyes at 6:12 am). School buses are running an hour late. Cathi checked email and somewhere else on line to see if her building was open before she ventured out into the cold… No word, it looked like she would not get a snow day today, and so, reluctantly, she grabbed her stuff and off she went. I thought I’d have more to say about the Hobbit movie, and I might later. Also thought I’d have more to say about the news lately. Premiers are meeting to discuss what to do about the pension problems they’re trying to scare everybody into believing. I have an idea- lock all politicians up in jail and donate their monthly pensions to the ‘Everybody Else’s Pension Fund’ fund, and that should take care of it. Remember, don’t believe a word a politician tells you. They have an agenda- more likely they have a lot of agendae- and making your life better, more secure, safer, happier… is not on their agenda. & Oh- I did hear something yesterday. The Canadian woman who was turned back at the US border and not allowed to go to New York City, get on a Cruise Ship and enjoy the vacation she paid a lot of money for because they’d tapped into her records and discovered that she’d been treated for depression in the past couple years? Reportedly: the US Border Guard told her that if she wanted to try again she would have to get letters from 3 Homeland Security approved Psychiatrists. Welcome to the Fascist States of Amerika. without a doubt donate to this excellent blog! I suppose for now i’ll settle for book-marking and adding your RSS feed to my Google account. recommend any other blogs/websites/forums that deal with the szme subjects?Thanks for your time! Thiis info iis priceless. When can I find out more?